Aurora Water has finalized the purchase of water rights associated with the London Mine, located near Alma, in Park County. 1,411 acre feet (af) of water has been acquired at price of $22,000 per af, with additional costs of $2 million for an option to acquire additional water rights as they are developed and $1M for an easement. An acre foot of water is 325,851 gallons, enough water to serve 2.5 households on average. The seller of the rights is MineWater Finance, LLC and No Name Investors, both Colorado companies. The total value of this initial purchase is $34,042,000. The sellers are confident that the source of the rights could ultimately result in additional water that Aurora has the exclusive option to purchase for $21,500 per acre foot. Aurora Water completed substantial due diligence prior to this initial closing. Additional water rights under the option provision will be purchased as they are adjudicated and decreed through Colorado’s Water Courts. Aurora Water is only purchasing the water rights. MineWater will continue to be responsible for the mine property, wells and associated permits. Questions regarding the mining operations, including the permits, should be directed to the MineWater contact listed above. Click here to read the London Mine Purchase and Sale Agreement Fact Sheet. Click here to read the mine water attachments to the release. From 1874 until the 1940s, the London Mine was one of the top-producing gold mines in the state. It also produced lead, silver and zinc. In 1991 the mine eventually closed, but a fault within the mountain created a natural reservoir, one that fills with snowmelt. In the nearly three decades since the mine has been closed, the state health department and U.S. Environmental Protection Agency have had their eye on the mine and its previous owners. In 2009, 2011 and 2013 CDPHE cited the mine for violating the discharge permit. A treatment plan for the mine was created, but it failed. And in 2016 CDPHE slapped the owner previous to MineWater with a $1.1 million fine. Water officials and MineWater have studied the water, and will continue to do so, to make sure it’s a safe source. MineWater, which has completely reworked the plumbing of the mine, will still continue its operations and hold all mine permits. Aurora water is only purchasing the water rights. Aurora’s futuristic recycled water project — Prairie Waters— is running at full-tilt for the first time in its eight-year history, a move designed to make the city’s water supplies last longer in the face of severe drought conditions. “We’re pushing it as hard as we can,” said Greg Baker, a spokesman for Aurora Water. By April, Prairie Waters was running at full speed, generating 9.7 million gallons a day (MGD), up from 5.1 MGD last summer, a 90 percent increase in production. Twenty-five Colorado cities, including Denver, Colorado Springs, Fort Collins and Louisville, operate recycled water facilities, according to the Colorado Department of Public Health and Environment, but that water is used primarily to water parks, golf courses and to help cool power plants, among other nonpotable, or non-drinkable, uses. But Aurora, faced with fast-growth and a shortage of water, realized more than a decade ago that reusing its existing supplies and treating them to drinking water standards was the only way to ensure it could provide enough water for its citizens. 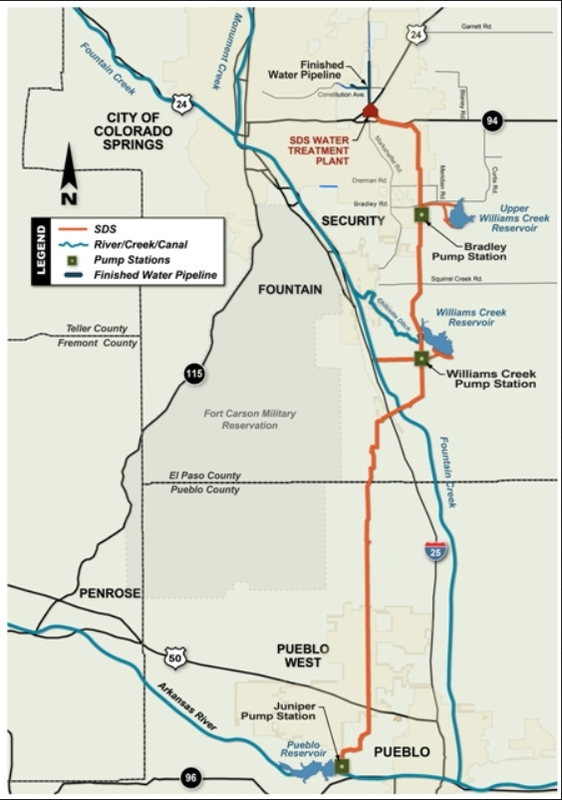 Completed in 2010, the Prairie Waters Project recaptures treated wastewater from the South Platte River and transports it back to Aurora through a series of underground wells and pipelines. As the water makes its 34-mile journey from a point near Brighton back to the metro area through subsurface sand and gravel formations, it undergoes several rounds of natural cleansing. 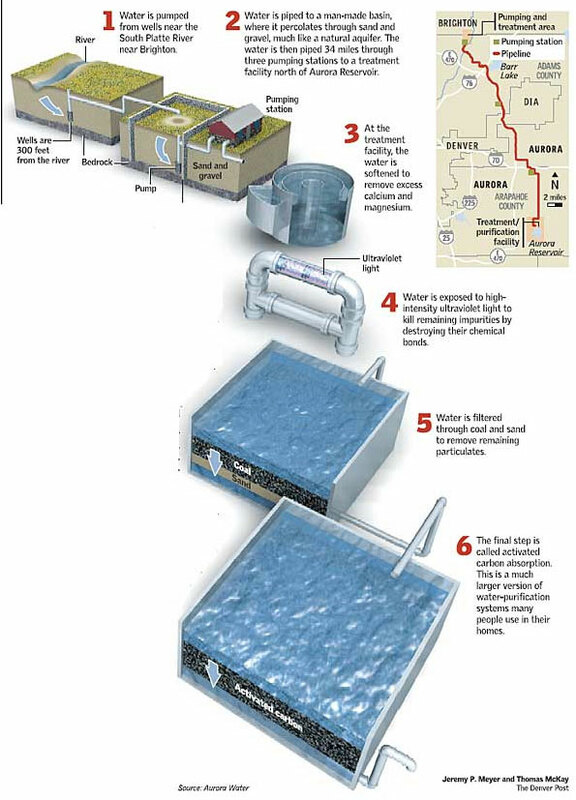 Once it reaches the Prairie Waters treatment facility near Aurora Reservoir, it runs through a series of high-tech purification processes using carbon filters, UV light and chlorine, among other chemicals. Then, before it is delivered to homes, the reused water is mixed with the city’s other supplies, which derive from relatively clean mountain snowmelt that is carried down from the mountains. For years, Castle Rock Water has made providing long term, renewable water a priority. Now, a major milestone has been reached and the first drops of WISE water are headed to Town. Join the celebration to help commemorate this accomplishment and take a look at what’s coming up next for water in Castle Rock. The fun-filled family celebration will be from 4:30 to 6:30 p.m. Friday, June 8. Bring the kids, sunscreen and a great attitude to Gemstone Park, 6148 Sapphire Pointe Blvd., to join the festivities and celebrate the WISE water partnership. After stakeholders officially cut the ribbon, the community is invited for a festival full of games, food trucks, bump soccer, bounce houses, a foam party, giant bubbles, water colors and more. Plus, get a chance to meet the Most Hydrated Man in Castle Rock. Learn more about the celebration at http://CRgov.com/WISEWater. The celebration will help mark more than 9 years of planning and $50 million in infrastructure to help ensure the community’s strong water future. When the WISE partnership was created, many communities in Colorado were faced with a drought. With limited, non-renewable resources, communities knew they needed to come up with a plan. Regional water providers saw the opportunity to partner in a solution and share in the expense to buy, transport and treat renewable water. The WISE partnership is an arrangement between Denver Water, Aurora Water and 10 other south metro water providers to import renewable water. Castle Rock is the southernmost community partner. Castle Rock Water finished the last piece of infrastructure – connecting a pipeline from Outter Marker Road to Ray Waterman Treatment Plant – in late 2017. The first drops of imported WISE water came to Town in late April. Follow the entire journey for WISE water with the Most Hydrated Man at http://CRgov.com/WISEWater. DENVER, Aug. 16, 2017 – One of the most exciting water projects in Colorado’s history is now live. After years of planning and development of critical infrastructure, water deliveries have begun for the Water Infrastructure and Supply Efficiency Partnership, known as WISE. WISE is a regional water supply project that combines available water supplies and system capacities among Denver Water, Aurora Water and the South Metro WISE Authority, which consists of 10 water providers serving Douglas and Arapahoe counties. Participating South Metro communities include Highlands Ranch, Parker and Castle Rock, among others. The innovative regional partnership is one of the first of its kind in the West and a major component to the region’s cooperative efforts to address long-term water supply needs. The WISE project has garnered unprecedented statewide support for its collaborative approach, which draws a stark contrast to water feuds of the past. WISE allows the participating water entities to share existing water supplies, infrastructure and other assets in the South Platte River basin in ways that are mutually beneficial. For communities in the South Metro region, WISE provides an additional source of renewable and reliable water supply and helps to reduce historical reliance on nonrenewable groundwater. Since the early 2000s, the region has made tremendous progress transitioning to a renewable water supply while ramping up conservation efforts. For Denver, WISE adds a new emergency supply and creates more system flexibility, while allowing Denver Water to use water imported from the Colorado River multiple times for multiple purposes. For Aurora, WISE creates revenue that helps stabilize rates for municipal customers while creating added value from existing water and infrastructure. By reusing water imported from the Colorado River through Denver Water’s water rights, the project provides a new sustainable supply without additional Colorado River diversions. A portion of the WISE water rate also goes to the Colorado River District to support river enhancements within the Colorado River basin. In 2015 WISE became the first water infrastructure project ever to receive funding from Basin Roundtables — groups of regional water leaders who help shape statewide water policy — across the state because of the example it set of regional cooperation. It also received financial support from the Colorado Water Conservation Board. Others expressing public support of the project include Gov. Hickenlooper; U.S. Sen. Cory Gardner; U.S. Reps. Ed Perlmutter and Mike Coffman; and David Nickum, executive director of Colorado Trout Unlimited. Since finalizing the WISE delivery agreement in 2013, WISE members have been hard at work putting in place the infrastructure and processes that will allow the parties across the Denver metro area to combine water supplies and system capacities. · Developing a new computer system that enables up-to-the-minute coordination between all entities. Aurora, Colorado is facing the water supply problems of many cities and regions in the arid west—a changing climate alongside a growing population. To combat these issues and secure the area’s water stability, Aurora Water worked with regional partners to create the Prairie Waters system, a innovative system that recapturing and recycling water to provide drinking water and drought insurance for the region. Using a multi barrier treatment process that includes both naturally-existing systems and state-of-the-art purification systems, Prairie Waters provides an additional twelve million gallons of clean, safe and dependable water each day. The Prairie Water program will help meet Aurora’s complex water needs for decades to come and can be a model for other regions experiencing changes in their water supply needs. 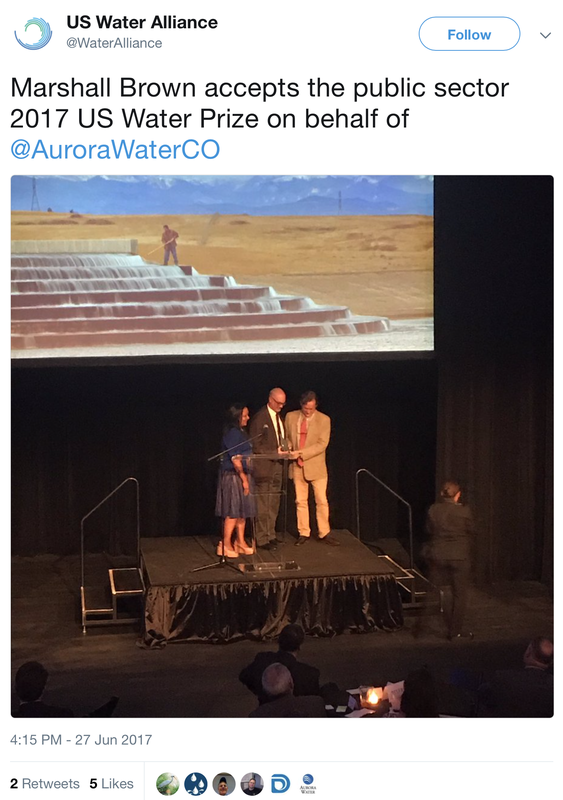 Aurora’s Prairie Waters system has won the U.S. Water Prize from the U.S. Water Alliance. The system was given the honor for its environmentally friendly and sustainable approach to water development. The aware panel also said the Prairie Waters system can be a model for other regions experiencing changes in water supply needs. Accepting the award at a ceremony in New Orleans on Tuesday night was Marshall Brown, the director of Aurora Water. Two Front Range cities along with Western Slope parties and the Climax Molybdenum Co. hope to narrow their plans during the next 18 months for new or expanded reservoirs in the upper Eagle River watershed near Camp Hale. One configuration of a possible new reservoir on Homestake Creek, a tributary of the Eagle River, would force a minor tweaking of the Holy Cross Wilderness Area boundary. That adjustment along with the presence of ecologically important wetlands along where Whitney Creek flows into Homestake Creek are among the many complexities that partners — including the cities of Aurora and Colorado Springs — face as they consider how to satisfy their projected water needs. Work underway this fall and expected to wrap up next year focuses on technical feasibility of individual projects. None alone is likely to meet the needs of all the partners. Also at issue is money. One set of projects would cost $685 million, according to preliminary engineering estimates issued by Wilson Water Group and other consultants in April. Aurora Water’s Kathy Kitzmann likens the investigation to being somewhere between the second and third leg around the bases. “We’re not in the home stretch,” Kitzmann said at a recent meeting. Still to be decided, as costs estimates are firmed up, is how badly Aurora, Colorado Springs and other water interests want the additional storage. The Glenwood Springs-based Colorado River Water Conservation District has decided it only needs another several hundred-acre feet of yield. John Currier, chief engineer for the river district, said that the less expensive studies have been done. Coming studies will be more expensive. “I think we are to the point that the cost of investigations themselves are going to start driving the decisions, and I also think that the timing and need of the partners is helping drive those decisions,” Currier said. At one time, the idea of pumping water eastward from Ruedi Reservoir was considered. That idea has been discarded as part of this investigation. This exploration of water what-ifs is governed by a 1998 agreement, the Eagle River memorandum of understanding, or MOU. The MOU envisioned water projects collaboratively constructed in ways that benefit parties on both Eastern and Western slopes, as well as Climax, the owner of the molybdenum mine that straddles the Continental Divide at Fremont Pass. Minimal environmental disruption is also a cornerstone of the agreement. The collaboration stems from a milestone water case. Aurora and Colorado Springs in 1967 completed a major water diversion that draws water from Homestake Creek and its tributaries. Homestake Reservoir has a capacity of 43,500 acre-feet, or a little less than half of Ruedi, and is located partly in Pitkin County. The water is diverted via a 5.5-mile tunnel to Turquoise Lake near Leadville and into the Arkansas River. Near Buena Vista that water is pumped 900 feet over the Mosquito Range into South Park for eventual distribution to Aurora and Colorado Springs. But the cities left water rights on the table. In 1987, they returned to Eagle County with plans to divert water directly from the Holy Cross Wilderness. But Colorado had changed greatly from 1967 to 1987 and state laws adopted in the early 1970s gave Eagle County expanded land-use authority. County commissioners in 1988 used that authority to veto Homestake II. That veto, which was appealed all the way to the U.S. Supreme Court, along with the denial of the Two Forks Dam southwest of Denver at about the same time, signaled that Colorado was in a new era of water politics. Under Colorado water law, though, the two cities still owned substantial water rights in the Eagle River Basin. Guided by the Glenwood Springs-based Colorado River District, negotiations led to an agreement to develop projects to jointly benefit the former protagonists: 10,000 acre-feet of guaranteed dry-year yield for Western Slope users, 20,000 acre-feet of average-year yield for the cities, and 3,000 acre-feet for Climax. Eagle Park Reservoir is an off-channel reservoir located on property formerly owned by the Climax Molybdenum Company (Climax) at the Climax Mine in the upper Eagle River Basin, which was originally used to store mine tailings. As part of the mine reclamation process, Climax removed tailings deposits from the reservoir and converted the facility to a fresh water storage reservoir. In 1998, Eagle Park Reservoir Company (EPRC) purchased the reservoir from Climax and began using it for municipal, industrial, irrigation, and environmental water supply purposes. Photo via Leonard Rice Engineers. Expansion of Eagle Park Reservoir is one option being studied. Located near Fremont Pass at the headwaters of the East Fork of the Eagle River, it was originally created to hold mine tailings from Climax. In the 1990s it was gutted of tailings in order to hold water. A consortium of Vail Resorts, two-interrelated Vail-based water districts, and the Colorado River District combined to create a reservoir. Aurora and Colorado Springs agreed to subordinate water rights in order to ensure firm yield for the Western Slope parties. To expand the reservoir from the existing 3,300 acre-feet to 7,950 acre-feet could cost anywhere from $39.1 million to $70.8 million, depending upon how much work, if any, is needed to manage seepage beneath the existing dam. Test borings that began Sept. 12 will advance the design of the larger reservoir. Five possible configurations date from 1994. Another option is to create a new relatively small dam on or adjacent to Homestake Creek, near its confluence with Whitney Creek. This is three miles off of Highway 24, between Camp Hale and Minturn. 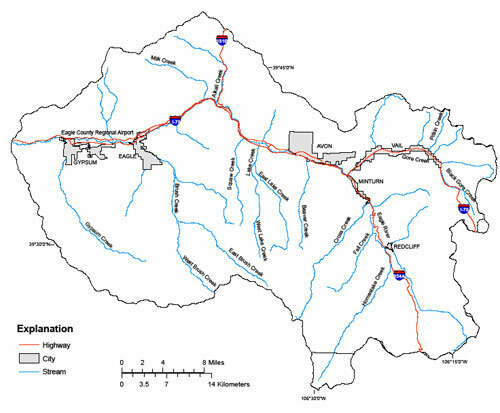 Among the four possible configurations for this potential Whitney Creek Reservoir is a tunnel to deliver water from two creeks, Fall and Peterson, in the Gilman area. A third option is restoration of a century-old dam at Minturn that was breached several years ago. Bolts Lake, however, would serve only Western Slope interests. Still on the table is a new reservoir on a tributary to the Eagle River near Wolcott. That reservoir has been discussed occasionally for more than 30 years. However, like a Ruedi pumpback, it’s not part of the current discussion involving the Eagle River MOU partners. Most problematic of the options is Whitney Creek. It would require relocation of a road and, in one of the configurations, water could back up into the existing wilderness area. For that to happen, Congress would have to tweak the wilderness boundary. “If fens are found, I expect a lengthy debate about the quantity and quality of fens required to be a fatal flaw,” said the river district’s Currier in a July memorandum. That determination will be made before drilling is authorized to determine whether a dam is possible. 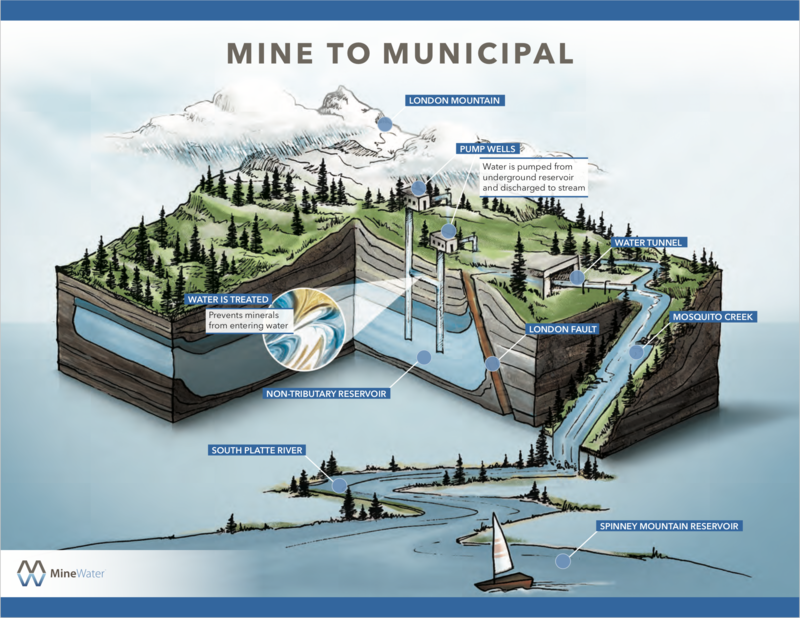 Nearly all the alternatives being considered in the Eagle River Basin would require extensive pumping, as opposed to gravity-fed reservoir configurations. Water would have to be pumped 1,000 vertical feet into Eagle Park Reservoir, for example, then pumped again to get it across the Continental Divide. A Whitney Creek Reservoir would require less, but still expensive pumping. Water in the reservoir would be received by gravity flow, but from there it would be pumped about seven miles up to Homestake Reservoir. Whether it can accommodate more water has yet to be determined, one of many dangling question marks. Earlier, the parties had investigated the possibility of using an aquifer underlying Camp Hale as a reservoir. But drilling to determine the holding capacity proved maddening complex. Accounting for water depletions from pumping would have been very difficult. Further, operation of the system to prevent impact to other water users and instream flows would have been problematic. The idea was abandoned in 2013. Currier, in his July report to the River District board of directors, outlined several questions that he said should provoke discussion among the Eagle River partners this fall: How much of the water outlined under the 1998 agreement does each party realistically need, and when? Are they ready to begin seeking permits after this new round of investigation to be completed next year? This week, in response to questions from Aspen Journalism, the Eagle River MOU partners explained the need for the water to be developed between 2036 and 2050. Both Aurora and Colorado Springs have added major projects in recent years. After the drought of 2002, a very-worried Aurora pushed rapidly for a massive reuse project along the South Platte River called Prairie Waters. It went on line in 2010 — far more rapidly than any project on the Eagle River could have been developed. Colorado Springs last year began deliveries of water from Pueblo Reservoir via the Southern Delivery System, an idea first conceived in 1989. The Vail-based water districts also increased their storage capacity after 2002. At a meeting in Georgetown in August, representatives of the two cities said they were unsure of the precise need for water. The 1998 agreement specified that costs of initial studies should be divided equally, four ways. As the project progresses, the costs are to be split according to percentage of yield that each party would gain. Editor’s note: Aspen Journalism and the Aspen Daily News are collaborating on the coverage of rivers and water. More at http://www.aspenjournalism.org. A regional partnership called the Northwest Douglas County Water Project will result in renewable water for existing homes and businesses in rural, northwest Douglas County by spring 2017. The water agreement — among Douglas County, Aurora Water, Centennial Water and Sanitation District, Roxborough Water and Sanitation District and the Colorado Water Conservation Board — will deliver treated water to about 180 homes and 31 businesses in the northwest communities by February. The county’s role in the partnership is its Water Alternatives Program, which was created in 2013 in an effort to help communities that owned wells. The county also took the lead in securing Aurora Water as a partner, according to a media release from county officials. Communities will share infrastructure, Moore said, which is much more cost-effective. Roxborough Water and Sanitation will deliver treated water from Aurora Water to paying customers in Plum Valley Heights. 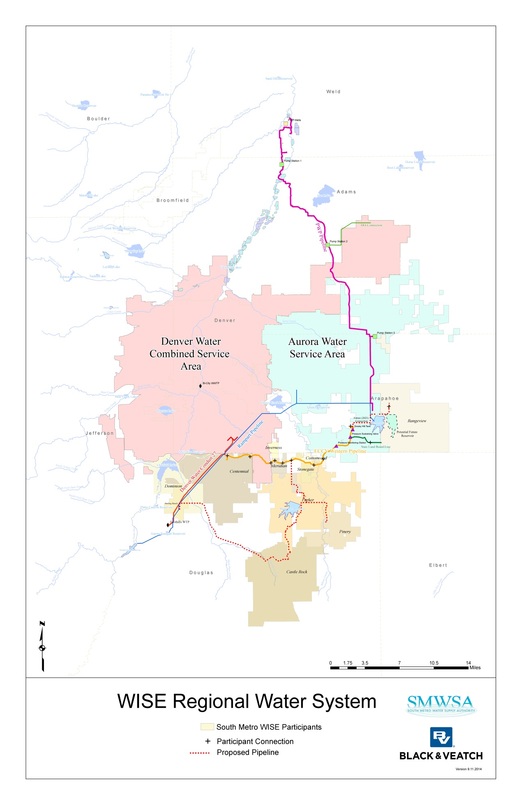 Centennial Water and Sanitation will treat, store and deliver water from Aurora Water to paying customers in Chatfield Estates, Chatfield Acres and Titan Road Industrial. Construction of the appropriate delivery infrastructure is expected to begin next week.